Weather plays a huge role in the world of landscape photography. Outdoor photographers must be some of the keenest watchers of weather forecasts, hoping for that all important hint of what the light and conditions might be. I’ve spent hours watching forecasts and consulting websites to try and decide where and when to takes pictures. Over time I’ve come across some useful websites and strategies so I’d like to share some of these with you. The information that follows mostly refers to UK weather forecasts but the principles are relevant anywhere in the world. The Met Office’s UK forecast offers detailed forecasts up to five days in advance. In my experience, their forecasts for up to two days in advance are fairly accurate. However, if there is a complex weather system abound then forecasts can vary wildly and following them to the T often results in disappointment as predictions change from hour to hour. My first port of call is to look at the Met Office’s forecast data, paying particular attention to the temp, wind and visibility readings. The Met Office’s cloud and rain map shows the predicted course of cloud movement and where rain will form up to roughly 24 hours in advance. This map can be useful for assessing where there will be breaks in the cloud and help you get a feel for what the sky will look like. In addition to the Met Office’s forecast it’s worth checking a satellite image of current cloud coverage. Here, I recommend looking at one of the many satellite images that are available. I use the Allmetsat website which looks a bit dated but it loads fast – perfect if you’re accessing the web via a mobile. The Met Office has a satellite map too but it’s not mobile friendly. If it’s night time, a visible satellite image like the one I just mentioned won’t work so you can instead refer to an infrared map. Meteosat provides one such map but there are plenty available online. The Photographer’s Ephemeris (TPE) is a must-have app for any outdoor photographer. It allows you to see where the sun (or moon) will be at a particular time on any day of the year. Use it to pinpoint your intended location then note where the sun will be. Zoom out of the map until you see the whole of the UK. At this level you should be able to see where the yellow or orange sunrise/sunset lines start and finish. The ends of these lines are where the sun will appear/disappear and this detail is particularly useful at sunrise or sunset. Click on the details button below in the bottom right then move the time slider to see the yellow and orange lines move, indicating the sun’s position throughout the day. Cloud overhead but not covering the point of sunrise or sunset might allow for some interesting pre-dawn or post-sunset colour as the cloud gets lit from behind. Different types of cloud filter light in different ways so partial cloud can create all sorts of colours in the sky. However, thick raincloud that stretches for miles is unlikely to be conducive to colourful effects. 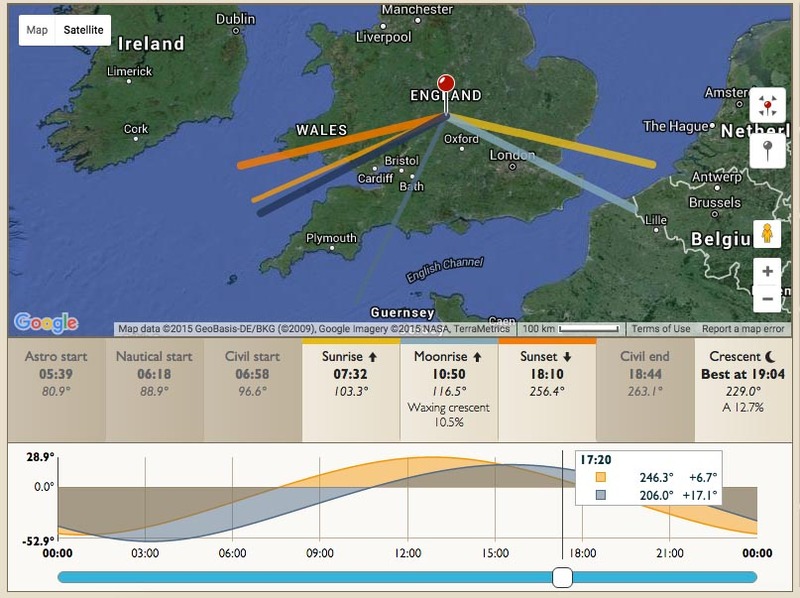 Note the sunrise or sunset time indicated by TPE and cross-reference that with the cloud cover at the next closest time on the Met Office forecast. Scroll through the cloud and rain forecast map and watch how the clouds move. Use this to predict roughly where cloud will be at the time you’re interested in. Aside from looking at national forecasts, it can be useful to look at current conditions recorded near to where you’re intending to take pictures. There are many weather stations in people’s gardens or workplaces throughout the country and these can be invaluable sources of data. Often valleys have their own micro climates and regional weather forecasts don’t provide enough detail in these places. Sites like Weather Underground list such weather stations, often with a link to readings from each station. Try searching for weather stations too as not all are listed on such sites. An accurate but less user friendly form of weather report can be found from many airports around the world. A METAR (translated from French it roughly means Aviation Routine Weather Report) is a reading of key information about wind speed and direction, visibility and cloud cover. Allmetsat METAR has a listing of METAR reports from around the world. For example, right now the reading from Bristol airport is a wind of 14 knots from south/southwest, visibility of 10km or more, broken clouds at 800ft and scattered clouds at 2500ft. This is really useful information, particularly for determining cloud height which isn’t indicated in most forecasts. METAR isn’t the easiest of reports to read so I recommend searching for a guide in how to read the reports. Weather Underground has a good guide. Similar to weather stations, webcams are dotted around the country, often at popular tourist destinations, in national parks and on the road network. They’re another useful source of information and can give an indication of cloud cover and visibility. These weather websites and TPE should be used together to help you build a picture of what the weather is going be like. After time you will get a feel for how a forecast relates to real-life conditions. For example, humidity of 96% and above plus low winds of 5 mph or less around dawn usually means there will be mist or fog. Heavy rain followed by a clear sky will usually give very good to excellent visibility, and that means intense, contrasty light if the sun breaks through cloud. These are just a couple of examples of how the weather forecast can indicate what photography conditions will be like. Aside from the weather, if you’re visiting a coastal location, knowing tide times is important. Here I recommend using Tides4Fishing. Tides4Fishing is useful as it gives tide times over a year in advance. It illustrates the tide height in graph format with indicators for when sunrise and sunset occur. I’ve found that its historic tide data is useful if I want to work out how high a tide was when I took a picture on a previous visit. For example, if I visited Kilve Beach on 1/9/12 and wanted to revisit it on a specific date in the future I could check the tide height on my first visit and get an idea of how much higher or lower the water level would be for my second visit. I could then imagine what the water level would be and how it might affect the pictures I take. Aside from studying weather websites, simply looking out of the window can be useful. We aren’t yet to the stage where computer data can predict what’s going on over our heads in a localised area (or even nationally, some might say). Local knowledge still rules as the land shapes cloud movement and thus how weather unfolds. On many occasions I have been at a location with clear skies when every weather forecast from the last three hours indicated it would be cloudy. There is something to be gained from taking chances and working in the moment rather than planning everything rigidly. If you have your own tips or useful websites I would be interested to hear them! Hi Stephen, I have enjoyed reading through your site! I thought I’d just add my 2d to your nice informative weather page. I guess planning is a big part of it for us Landscape photographers and it lessens the chance of us coming home without having taken the camera out of the bag! Anyhow the reason I dropped you a line was that I was passed a link for rather a good weather site. Bizzarly although it’s Norwegian it is remarkably accurate. You can select the English language and then run down and expand various options to get some quite detailed weather information. Just a word of warning, they do have a smartphone app, but sadly this is very poor and doesn’t give you anything like the depth of info on the web based site. The url is :- yr.no that’s it short and sweet! Maybe you could consider adding this to your list above so it can be used by fellow photographers! Thank you very much for the great weather links you have provided I use quite a few of those now. Thanks for your suggestion Steve. I like the level of detail on that site and it’s nice to have links to nearby webcams to see what’s happening at a location. I will see how accurate its forecasts are compared to other sites. Hi Stephen, great website. Great tips also on the weather. I’ve not seen such info before so thank you so much for putting it up. I’m fairly new to landscapes and weather is part of the game and reading it seems difficult. I’ve just used and book marked the tide time website you suggested. Anyway thanks and all the best, Mark.